It got better over time, of course, once more people understood. Once they had to understand. By the time it was all over, I was the weird one—still living a single life, still just one of a kind. And Roger—I guess they understood him better. It started in the kitchen of my apartment, like a thin spot in the wall or an echo coming through the ventilation ducts. I didn’t think anything of it at first, since it was the kind of thing you hear in apartments all the time—someone else’s private life bleeding through into your living space. Usually, it’s a murmur at most, a background drone. Sometimes, it’s suddenly and uncomfortably clear—a laugh or an angry shout that’s hardly muffled at all. I just ignored it. It was just somebody who had moved in next door—somebody on the other side of my walls, somebody who had brought their own new sounds that would become partly my sounds, too. I knew how it worked. If ever we passed in the hall, we would pretend we didn’t hear each other. I wasn’t the sort to complain. The walls were thin. My kitchen had an echo. That was all. That was all, at least, until the day I was pulling a casserole out of the oven, singing some Cher to myself. Too loud, I guess, because suddenly and without warning a man’s voice was at my ear. Not through the wall, not above the ceiling, but in the kitchen, at my ear. I dropped the dish, and the casserole exploded into shards of glass and soggy macaroni. I bolted for the living room, heart pounding, as the voice shouted behind me. The mess sat on my kitchen floor for three whole days before I worked up the nerve to go back in there and clean it up. It was the news that saved me. That’s how I found out that I wasn’t the only one. They had a whole segment about these strange disembodied voices coming out of the air—in people’s houses, in offices, at the shopping mall, everywhere and anywhere. They started as indistinct mutters, but were growing clearer. Some people said they could make out whole sentences. That evening I lay alone in my bed, the covers pulled up to my face even though it was a warm night. I could hear footsteps in my apartment, as if somebody were walking from room to room. I could hear doors opening and even the toilet flushing. At last, the footsteps came into my bedroom. I waited until they came close, and then I took a deep breath. Pulling up all the courage in my body, I called out softly. He claimed he wasn’t really a disembodied voice. He said he was just a normal guy with a body, and that he’d been hearing the same kinds of sounds in his apartment. But my voice, my footsteps, my shattering casserole dish. Somehow, we could hear each other. We found out pretty quickly that we lived in the same city. Then on the same street. I didn’t want to tell him my address, but he told me his. It was the same—down to the apartment number. According to Roger, we lived in the same apartment. It was the same date. That was where we left it that first night. It was getting too spooky. I had been almost willing to believe in a hole in space or time—a ventilation duct through the universe where two people in different places or times could accidentally hear each other. But this didn’t make any sense, and I realized suddenly I was exhausted. “Well, good night,” I said weakly. “I’ll try not to snore,” he said. And then, after hours of talking, that one joke suddenly unnerved me. I realized that this wasn’t like hanging up the phone or signing off instant messaging. When we stopped talking, he’d still be there, or here, or wherever. A few minutes later, I picked up my pillow and crept as quietly as I could to the living room couch. Here’s what the scientists said on the news—finally—a few days later. Every instant, they said, an infinite number of parallel universes are created as an infinite number of decisions are made. Usually, those universes just split apart and go off on their own separate courses, never to touch again. But sometimes, two universes that had split in the past drift back toward each other. Sometimes, they even get close enough to merge back together again. They said it probably happens all the time, but typically things in the two universes are so similar that we don’t even notice. Maybe, they said, the few anomalies and differences are what have always been reported as ghosts or UFOs. This time, however, the two universes split some time ago—no one really knew exactly, but maybe five years, maybe fifty years. Because of that, things were different. As the two universes bumped into each other, they wouldn’t just mostly overlap like usual. We would notice all the little and big differences—probably millions of them. And when they merged—if they merged—well, who knew what would happen? After hearing the scientists explain it all, I decided to talk to Roger again. I’d been tip-toeing around my apartment, trying to ignore the sounds that Roger made—which were becoming clearer and clearer all the time. The sneaking and daily panic attacks had started to seem almost normal, but then I realized I was being an idiot. That same silence followed, and then another single word answer. We talked almost every night from then on. I got to like it. I got to like Roger’s voice—calm and musical, with something that sounded like a hint of an accent. He said he’d been born in Ireland but moved to the States when he was five years old. Maybe I was just wishing he had an accent. Eventually, I stopped slipping off to the living room to sleep. Once I got to know Roger better, I realized he was funny and kind. And, to me, he still was just a disembodied voice. There wasn’t really anything to be afraid of. Sometimes, it was even nice, in the still dark hours of the morning, when I woke suddenly from a dream to hear him breathing calmly in the room not far away. The more people talked between the worlds, the more it seemed like things were mostly the same in both universes—not exactly, but pretty close. According to the news, scientists were working on figuring out when our two worlds had diverged and whether they would likely “bounce off” each other or end up merging. By this time, Roger and I were talking long into the nights. Not just comparing the differences and similarities of our universes anymore, but just about ourselves. What we did that day, what we hoped to do tomorrow. It seemed natural to us, but we were the exception. Lots of people were still pretending that nothing was happening, still keeping as quiet as possible so the “new neighbors” wouldn’t hear. Some people had discovered other versions of themselves coming through from the other universe. I was glad that wasn’t the case for me, and I never asked Roger to find out if there was another version of me living in his universe. Whether better or worse, I didn’t want to know what might have been different about my life. I didn’t even want to think about it. But sometimes I was tempted to see if there was a version of Roger in my universe. I liked him—I wanted to meet him, to see him. I even put his name into Google once and pulled up a Facebook profile. But I knew right away that this other version was different. Even if I did meet him in the flesh, he wasn’t this Roger—my Roger. So I closed the browser and just kept what I had instead, the calm musical voice in the night as I lay in my bed under the moonlight. Eventually, the universes got close enough that things started to bleed through, too. I’d trip over something as I came back home to my dark apartment. “Did you leave your boots by the door again?” I’d ask. As the universes drew closer, it started happening all the time. Sometimes, there’d be two similar objects sitting next to each other—two lamps (mine and his) crowding an end table. Other times, it was like new space had been created for the new objects—my dresser grew extra drawers that were full of men’s clothes. I laughed when I realized he folded his socks. Somehow, I was still unprepared for the morning when I woke to find my bedroom twice as large as usual. On one side of my bed, where there should have only been a wall, there stretched another room that was a mirror image of mine—or a mirror image of what mine could have been, had it been furnished and decorated by somebody else. There was a dresser, a desk, a computer, a bookcase. There was a bed. In the bed was a man. I shouldn’t have been shocked. I should have been used to weirdness by then. But everything else had felt like a kids’ game—like talking through a tin-can-and-string telephone, or leaving messages and gifts for each other in a hollow tree. But now, everything was suddenly very real. I sank back down into my own bed, my heart fluttering and my throat tightening. I didn’t dare get up or make any noise. It was Roger, of course—it had to be. It was the man I had been talking to every day, now unexpectedly deposited in my bedroom. Or had I been deposited in his? Some time later, I heard stirring from his side of the room. I screwed my eyes tighter shut. Then I heard his voice. “Wow,” he said. It was clear and natural—like a voice sounds when it really is right next to you, not screened through the borders of two different universes. “Hey, Jennifer,” said the voice again—said Roger again. He sounded like he was in total wonderment. He didn’t sound frightened, only amazed and excited. Ages seemed to pass while I waited for Roger to speak again. I could hear him on the edge of his bed, the box springs squeaking under him. I wondered how many others around the world were having the same experience that we were right now. I wondered how they were taking it. And slowly, somehow, I felt myself unfurling, turning toward him, responding instinctively to his voice like a plant responds to the sun or moisture or gravity. I sat up on my own bed, facing him, and then at last I opened my eyes. For a long time, we just sat there, separated by a short gulf, and looked at each other. But after a while, looking didn’t seem like enough. Roger crossed over from his world to mine the first time that morning. Later, I crossed over to see what his side looked and felt like. We learned later that most people didn’t do that—at least, not right away, not until they knew it was safe. The geometry of the Collision was something I never really understood. Almost every space suddenly had a double. It was still possible to travel in all the usual directions—north, south, east, west, up, down—but it was as if a new direction and a new dimension had been added. A lot of people were worried about what this would mean. Whether it meant that one world would obliterate the other, or people might get trapped on the “wrong” side if the worlds suddenly separated. Or if this meant we’d end up with one world with two versions of almost everything, all squished together. But Roger and I didn’t really care about any of those questions. We were too busy finding out that we were in love. A couple months later, I took Roger to visit my parents. We drove three hours to Pennsylvania, carrying a bottle of wine with us. My parents insisted on ignoring the fact that Roger had come from the next world over—my mother simply hovered nervously, fetching cheese trays and lemonade, while my father made bland small talk about whatever he thought would be a safe topic. All around my parents’ house, they had pinned up long rows of bedsheets. Anywhere that the other world might peek through, they had hung sheets and blankets as privacy curtains. Whether they were hung from this side or that side—I couldn’t tell. For some reason, it made me furious. Later, as I was putting on my shoes to leave, I heard a laugh come from the other side of one of the sheets. Lifting a corner, I peeked under. In a room that looked remarkably like my parents’ living room, I saw my father—or a version of my father—sitting on the sofa with his arm around a woman. But the woman—something was wrong with her. No matter how I scanned her features, I couldn’t make that woman fit into the form of my mother. Both of the people on the other side glared at me. Even as I let the sheet fall with a mumbled apology, my blood turned icy in my veins. I suddenly understood my mother’s fury. I was furious, too—as irrational as that was. Obviously, something had happened—in that other world, something was different with my parents. They had divorced, or my mother had died, or they had never met. And there, on the other side of all those sheets and blankets was that other life—probably neither happier nor sadder than this one, just different—and it was getting closer. Every hour, every day, as the Collision progressed, those other people were pushing into my parents’ rooms and their lives. Soon there might be no way to keep them out. That night, at the motel, there was nobody renting the room on the other side. I told Roger I wanted to be alone, and I went to sleep on the bed in the other universe. It was cold and empty, but at least it didn’t crowd me. As space grew tighter, objects from each world started to meld together. It started with the biggest ones first. Where there had been twice as many skyscrapers on the skyline, there were once again the usual number. The duplicates had vanished, pushed together into single buildings occupying more or less the same space they had originally. The same happened for houses and stores and restaurants. Where there were differences, the result was a combination of the two—a little from this world, and a little from that. It was unnerving, and often the slightness of the changes made them more so. Many times I stood looking at a building or holding an object in my hand, trying to figure out if it really had changed, or if I had just imagined it. Even the furniture in our fast-shrinking apartment had become a hodgepodge. The dresser was mine, but it had the knobs from Roger’s. The desk was his, but my initials were carved in the bottom of one of the drawers. The books on our bookcase became weird entanglements of two stories told at once. I tried to read a few, but nothing made sense and I was left with unpleasant headaches. I guess it was supposed to make it seem natural. It was meant to suggest that this was somehow a return to order, or the result of some natural process. A flood might be violent while it happened, but once the water found its level, the torrent was replaced with a peaceful lake. It was also meant, I suspect, to keep us from thinking too much about what would happen to the people. There was no other version of me in Roger’s universe. Eventually I asked him, and he told me that he had looked but never found one. It seemed clear enough—whatever had changed about my parents had also erased me. I didn’t ask for details, didn’t want to know. Whether I had died somehow or had just never existed, I didn’t want to know. Roger never asked about himself. Maybe he did his own research on his visits here—before all the phone books and Internet databases got entangled. Maybe he just knew. Either way, I didn’t tell him about the other version of him that I had found. I even knew where he worked: in a restaurant across town. I had tried to forget about his whole existence, and mostly I succeeded. Another Roger, only twenty miles away. It made me sick somehow. I was sorry that I had ever looked. But eventually, I went. Once everything started to meld together, I had to. Once there, I couldn’t bring myself to get out of my car and just sat in the parking lot, staring at the restaurant. Hours passed. I lost track of how many times I swore to myself that I would leave. Then, at last, the other Roger came out in a cook’s smock, chatting and sharing cigarettes with a waitress. I went numb as I watched him. He was the same, but not. I didn’t want to talk to him. I didn’t want to get to know him. I didn’t want to find out if I liked kissing him. He had long hair. He smoked. He worked as a cook. It sounds superficial, but that wasn’t the Roger I knew. I might not have cared about any of those things if I had met this Roger first. But that wasn’t how things had worked out. Somewhere, back in his life, he had made different choices from the Roger I knew. He had different priorities. But more importantly, my Roger was the one who had talked to me all those nights. This person, no matter how good the copy, hadn’t done any of that. That shared history had shaped some small part of my Roger—we had laughed together, cried together, discovered things together. None of that could be replaced, not even by this identical twin. There were countless programs on TV about people who had melded, or who were about to meld, or who wanted to meld. They all talked about feeling a strong pull, a desire, a need. And after their melding, they said it was the best thing that ever happened to them. How some imaginary hole in their being seemed to be filled. I just kept thinking that’s what people used to say about falling in love, but they made it sound like melding was even better than that. Whenever the subject came up, Roger and I would just argue. So we stopped talking about it, but it would come up anyway, in secret and infuriating ways. “Would you still love me . . .” Roger would say. “Shut up,” I would say. Eventually, I had to ask him. I blew up and asked him if he had ever wanted to be a cook, if he had ever had long hair, if he had ever tried a cigarette, if he had a thing for scuzzy waitresses with dyed hair and too much eye makeup. I didn’t tell him why I was asking, but he knew. After that, I had to wonder. Which Roger had made the good decisions and which one had made the bad decisions? Which of the Rogers, if they compared lives, would be the happier one? There were videos of people melding all over the Internet if you knew where to look for them. If you wanted to look for them. I didn’t like them—the insides and outsides, the flesh and skin, merging and oozing together. Things wriggling and writhing, skin splitting and sealing. They made me lightheaded. I hated them. The time when Roger was away for three days without calling, they were all that I watched. I recognized Roger immediately when he came back. I recognized both of them. He stood there in the hallway outside the apartment, a kind of hangdog expression on his face as he looked out from under his new long stringy hair through his old watery blue eyes. He didn’t say he was sorry. He didn’t say anything. He knew how I felt, but I guess he wondered the same things I did, about which Roger had made the right choices. This was just another thing that never should have surprised me. Water finds its level. As he stood there, his whole body was a question. Through my pain and fury and sorrow, I could see what he was asking. Could I find enough of the Roger I loved to let him stay with me? Could I find enough of him in there to try again? New and different were frightening, he seemed to say, but they can be exciting, too. Would I try this next experience with him? Could we discover this together too? With tears trembling in my lashes and my heart slowly tearing apart, I let him in. And then they’d give me that knowing, sympathetic look. They had all been there, from one side or another—with spouses or parents or children or friends. We don’t say that water finds its level anymore. I haven’t heard anybody say that in years. Everybody changes, and all we can do is accept it and move on. Everybody finds their other self, and they have that better-than-love melding experience, and suddenly they see everything twice as clearly and they know twice as many answers and priorities change overnight. And suddenly you’re on the other end of that double-clear stare, and you realize it’s quiet, patient pity in those pale blue eyes. You realize they’re thinking that you can’t ever understand life like they do. You realize that they’re sorry there’s just no vocabulary to tell you what it means to have walked in two different pairs of shoes. Yeah, everybody changes. Except those of us who don’t. © 2013 by M. Bennardo. M. Bennardo’s short stories appear in Asimov’s Science Fiction, Beneath Ceaseless Skies, Shimmer, Stupefying Stories, and others. 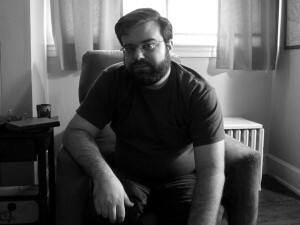 He is also co-editor of This Is How You Die, a science-fiction anthology coming from Grand Central Publishing in July 2013. He lives in Cleveland, Ohio, but people everywhere can find him online at mbennardo.com.